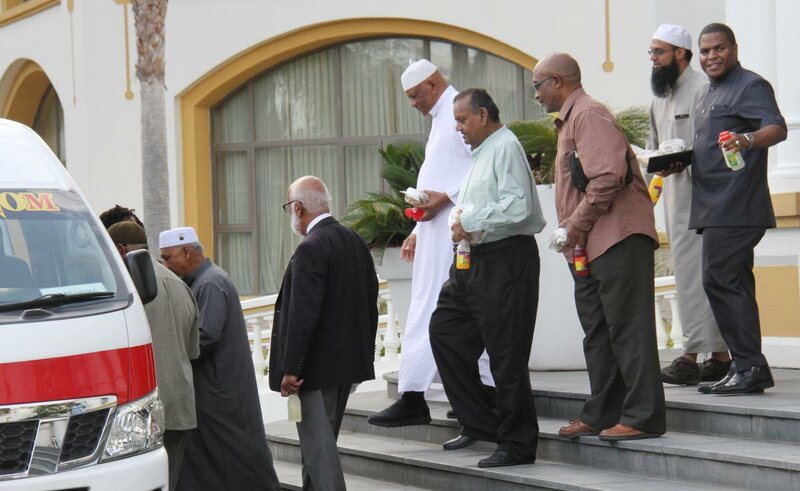 Muslim leaders leave the Diplomatic Centre in St Ann’s yesterday after a meeting with the prime minister. THE Prime Minister yesterday said government will ensure the right of Muslims to protection and an equal place in TT. Dr Rowley gave this assurance during a meeting with Muslim leaders at the Diplomatic Centre in St Ann’s. The meeting was held to address security concerns after last week’s attack on two mosques in Christchurch, New Zealand which left 50 dead and 48 injured. Rowley said their claim to an equal place in TT “is undisputed and greatly defended.” He told them TT was the best place for them to be at this turbulent time in the world. Rowley said he knew of no other country where “the level of freedom to practice your religion, to accept equality by gender and to accept protection without question by the State” is a given. He urged them, “Let us not take it for granted. After the meeting, National Security Minister Stuart Young said there is no intelligence of any criminal activities being planned against any religious group in TT. But Young added, “We will continue to be alert.” He reminded reporters that Police Commissioner Gary Griffith indicated there are increased police patrols at places of worship. Young said Government does not “buy into the narrative” that gang warfare in TT is a battle between Rastafarianism and the Muslim community. He disclosed that the Muslim community has pledged to help the Government in this effort. Young said Muslim leaders indicated they are working on a policy paper and have reached out to the Rastafarian community. Both groups will hold a news conference soon, Young disclosed. On TT nationals going to Saudi Arabia for the Hajj and problems in accessing forex for the trip, Young said the issue was raised with him and Rural Development and Local Government Minister Kazim Hosein. He said this matter will be discussed with Finance Minister Colm Imbert and the Cabinet. Reply to "You are safe"